More than 2,000 people, mostly Singaporeans and across ethnicities and ages, participated in the survey jointly conducted by Channel NewsAsia and the Institute of Policy Studies. The CMIO (Chinese, Malay, Indian, Others) racial categorisation system that Singapore uses, as well as race-based policies, still have a place in Singapore, going by a survey on what defines ethnic identity here. The CMIO framework seems to be important, said senior research fellow Mathew Mathews from the Institute of Policy Studies (IPS) in response to questions from the media during a briefing on Wednesday (Nov 8) on the findings of the survey done jointly with Channel NewsAsia. “The fact that even among our millennials, they care about some of the core markers of their identity ... they still think it's important. That tells us that ethnicity and how we identify ourselves as ethnic individuals continue to be important for many Singaporeans,” said Dr Mathews, who was the survey's principal investigator. He added that one of the benefits of the CMIO framework is it ensures that minorities will continue to be able to practise their culture in Singapore, and feel just as Singaporean as someone in the majority ethnicity. According to the study's findings, the current CMIO classification system, due to its use in public policy, may have resulted in Singaporeans’ perceptions of ethnic identity converging on certain key indicators such as language. When asked about whether there is a need for race-based policies such as the Group Representation Constituency (GRC) and reserved presidential election, Dr Mathews said that Singapore needs policies to ensure that “every one of our races in Singapore will be able to feel that they do not have to give up their particular culture, their language, what they feel is valuable to them”. The GRC system was put in place to ensure minority representation in Parliament, while a reserved presidential election is open only to candidates from a particular minority group to contest. The reserved election held in September this year caused unhappiness among a group of Singaporeans, who staged a so-called “silent protest” at Hong Lim Park. More than 2,000 people, mostly Singaporeans, participated in the survey, which was conducted by questionnaires being given to them and collected later. The survey aimed to study what Singaporeans felt were core identity markers of the main ethnic groups in the country. Singaporeans are more likely to accept a new citizen of Chinese, Malay, Indian or Eurasian descent as "truly Singaporean" than someone not from these groups, findings from a survey on ethnic identity in Singapore showed. These findings, released on Wednesday (Nov 8), were from a survey conducted from May to July this year by the Institute of Policy Studies (IPS) with funding from Channel NewsAsia. This indicates that the CMIO (Chinese, Malay, Indian, Others) racial categorisation system that Singapore uses is "closely associated" with national identity, principal investigator Dr Mathew Mathews, senior research fellow at the IPS said. Reflecting this, more than 90 per cent of respondents found it at least somewhat acceptable for someone with a Chinese, Malay, or Indian background to be accepted as “truly Singaporean” if they became a new citizen. "The clearest finding we can get from this is that our core ethnic identity, the CMI group, and to some extent the Eurasians, attract a very very strong level of consensus ... I think that reflects the salience of our CMIO model," said Dr Mathews. The 10 groups presented to respondents included Japanese, Korean and Caucasian, in addition to the core ethnic groups in Singapore. Ranking in the bottom three were those of the Filipino, Arab and African backgrounds. Even then, more than 60 per cent of the respondents accepted that these groups could be truly Singaporean. "Many Singaporeans have come to accept the fact that you can have Singaporeans of any kind of national background, as long as they choose to be naturalised, they can be accepted," Dr Mathews said. Passing down the ability to cook ethnic food, which includes dishes like nasi lemak, sugee cake and bak chang, was considered "unimportant" or "somewhat unimportant" when it came to ethnic identity for 40 per cent of respondents aged 21 to 25. On the other hand, more than 80 per cent of those above the age of 66 found this aspect important. Some aspects of ethnic identity, especially those not recognised on a national level, were not as important to younger respondents as to the older ones, Dr Mathews said. "Often, culture, when it is left to to itself, tends to fade. We have new ways of doing things. In the process, you can see a loss of many aspects of culture, which people might cherish." When certain aspects of culture are lost, people will begin to question the richness of their heritage and culture, he said. He added the especially for the Chinese, there is comparatively less importance in passing on traditions, like those for weddings and clothes. The lack of interest in passing on traditional cooking methods and recipes in order to retain ethnic identity however did not translate to passing on ethnic pride. Younger respondents were as likely as older respondents to consider passing down ethnic pride to their children as important. Three-quarters of respondents between the ages of 21 and 25 years regarded this to be at least somewhat important, as did 77 per cent of respondents aged 56 to 65. Respondents were presented with a list of more than 35 indicators across several broad categories including language, food, and lifestyle, and asked how important it was for someone who considers himself a Singaporean Chinese, Malay, Indian, or Eurasian to have or do these. Being able to speak, read and write in their community language and celebrating key festivals emerged as important aspects for Singaporeans when it came to identifying with their race. More than 86 per cent of all respondents found language to be at least somewhat important to their ethnic identity, while an overwhelming majority of respondents across the ethnic groups recognised the importance of celebrating their ethnic community’s key festival. Nearly 92 per cent of Chinese regarded the celebration of Chinese New Year as at least somewhat important, as did 96 per cent of Malays when it came to Hari Raya Puasa. Similarly, 88 per cent of Indians held such sentiments towards Deepavali. "State policies help to preserve certain aspects of culture, for example, language, key celebrations. and of course, participation tends to be higher because people are more aware of that," Dr Mathews said. Dr Mathews said that interestingly, speaking good English was also an important aspect of ethnic identity across the groups, a sign that what people identify with is fluid and evolving. More than one in seven respondents across Indians, Malays and Chinese thought that speaking good English was important to their ethnic identity. The report said that the survey, which involved more than 2,000 respondents across ages educational levels and ethnic groups, also showed that overall, ethnic identity was important to a majority or 63 per cent of respondents. However, despite policies to build awareness of, and interactions with, Singaporeans from other ethnic groups, Singapore is still not the “multicultural nirvana” that some would expect. "When we asked every community to rank what would be important to another community, the tendency was to not know how important some of those items may have been," Dr Mathews said, adding that this may reflect the lack of awareness about what is important to different groups. "That happens, especially when you don't participate enough in festivals, or the rituals of important ceremonies of each of these communities. The more we get those opportunities, the better," he said. Singaporeans are more likely to accept new citizens as being "truly Singaporean" if they are of the country's four core ethnic groups, according to a local study. They are, however, less accepting of people of other ethnicities, such as Korean or Filipino. More so if these new citizens are people from less-developed regions such as Africa, said researchers of the study on ethnic identity and inter-ethnic interactions done by the Institute of Policy Studies (IPS) and Channel NewsAsia. The findings, based on a survey of about 2,020 Singaporeans and permanent residents conducted between May and July, was released yesterday. The questions they were asked included how acceptable it was for a new citizen of a particular ethnic background to be viewed as "truly Singaporean". They had to choose from four options: "unacceptable", "somewhat unacceptable", "somewhat acceptable" or "acceptable". More than 90 per cent said it was at least somewhat acceptable for new citizens who are Malay, Chinese or Indian, while 84 per cent said the same for new citizens who are Eurasian. About 75 per cent would at least somewhat accept those of Japanese or Korean ethnicity as being truly local, while 60 per cent said they would do the same for those of Arab or African descent. Singapore gave citizenship to 22,102 people last year, most of whom came from Asia. Dr Mathew Mathews, an IPS senior research fellow who led the study, said the findings show that the Chinese, Malay, Indian and Others, or CMIO, framework resonates with Singaporeans. It demonstrates that the CMIO framework has a part to play in associating national identity with the core ethnic groups in Singapore, the researchers added. But only about half of Singaporeans say it is important to feel a connection to their ancestral heritage. Asked to rank the importance of feeling such a connection, with four options ranging from "unimportant" to "important", just slightly more than half of Malay and Indian respondents said it was at least somewhat important. For the Chinese, just 38.7 per cent said that having such a connection is at least somewhat important. On top of that, 84 per cent and 96 per cent of Chinese and Malay respondents said they felt the closest cultural affinity with Malaysia-born Chinese and Malay people, respectively. Indian respondents, meanwhile, saw themselves as closest in culture to those from India (93 per cent), while 90 per cent cited Malaysia-born Indians. Polytechnic student Alex Andres, 19, who became a citizen in 2008 after moving here from the Philippines, said locals had difficulty relating to her initially. But her ethnicity became less of a barrier when she made the move to learn more about local culture and quirks, like speaking Singlish. "As new citizens, we can try to integrate, and Singaporeans will respond by learning a little about our own culture - our cuisine, language. We somehow meet in the middle and come to an understanding." Eating halal food, wearing the tudung as well as avoiding alcohol and not touching dogs are perceived as important traits of being a Malay in Singapore. But when it comes to understanding these key facets of the community, younger Chinese and Indian respondents of a recent study were found to be less likely to understand their importance. For instance, on the point of not touching dogs, just 49 per cent of Chinese and 46 per cent of Indians aged 21 to 25 said it was important for the Malay community, compared with 74 per cent of Malays in the same age group. The new study by the Institute of Policy Studies (IPS) and Channel NewsAsia included 440 Malays out of 2,020 respondents. IPS senior research fellow Mathew Mathews said: "One takeaway is that while we care about our own ethnic identities, we need to learn how to respect and understand the important (ethnic) markers of other groups." The study also showed that younger Malay respondents felt less strongly about some of these ethnic markers compared to their seniors. For instance, 72 per cent of Malay respondents aged 21 to 25 indicated that wearing the tudung is "somewhat important" or "important", compared with 93 per cent of their counterparts aged 56 to 65. This sentiment towards religion was stronger among the Malays polled, compared with the 70.6 per cent of Indian respondents in the case of Hinduism, and the 37.4 per cent of Chinese respondents in the case of Buddhism or Taoism. And when it came to inter-cultural romances and dating outside their ethnic groups, Malays indicated that they were comfortable with their offspring going out with Chinese and Caucasians. This opinion was mirrored by the Indian community. For instance, 91.2 per cent of Malays in the 26 to 35 age group were comfortable with their offspring dating Chinese, compared with 85.7 per cent for dating Caucasians and 81.3 per cent for dating Indians. Among Indians in the same age category, 89.3 per cent were comfortable with their offspring dating Chinese, compared with 87.5 per cent for Caucasians and 75.4 per cent for Malays. However, the converse was true for the Chinese, with 74 per cent saying they were more comfortable with their offspring dating Caucasians, compared with 59 per cent and 54 per cent for Malays and Indians, respectively. Of 2,020 people surveyed, more identify with Singapore than their own ethnic lineage. Some 35 per cent of respondents in a new study on ethnic identity by the Institute of Policy Studies (IPS) and Channel News-Asia indicated this inclination as opposed to 14.2 per cent who chose their ethnic identity alone. However, the data also reflected that almost half - or 49 per cent of respondents - felt they had a "simultaneous" Singaporean and ethnic identity. On what comprised an ethnic identity, researchers noted that overall, the three major races ranked reading, writing and speaking in the community's language, and celebrating their community's main festivals, as important markers of ethnic identity. Nearly 92 per cent of Chinese regarded the celebration of Chinese New Year as at least somewhat important, as did 95.9 per cent of Malays when it came to Hari Raya Puasa, and 88.2 per cent of Indians for Deepavali. Respondents were also near unanimous in their agreement that the ability to read or write in an individual's ethnic language (93.3 per cent) and converse in one's ethnic language (94 per cent) is at least somewhat important to be passed down to future generations. However, the erosion of ethnic traditions and heritage also surfaced. For instance, millennials placed less importance on the ability to cook ethnic food and enjoy ethnic art and music. And while respondents valued their own ethnic identities, researchers found that inter-ethnic engagement was somewhat lacking. For instance, despite interest expressed in inter-cultural exchanges, a fair number of respondents do not participate in the cultural practices of those from other races, leading researchers to say that Singapore is "still not the multicultural nirvana that some would expect". For instance, 53 per cent of Chinese respondents said they participated in Malay festivals and 44 per cent of them took part in Indian ones. 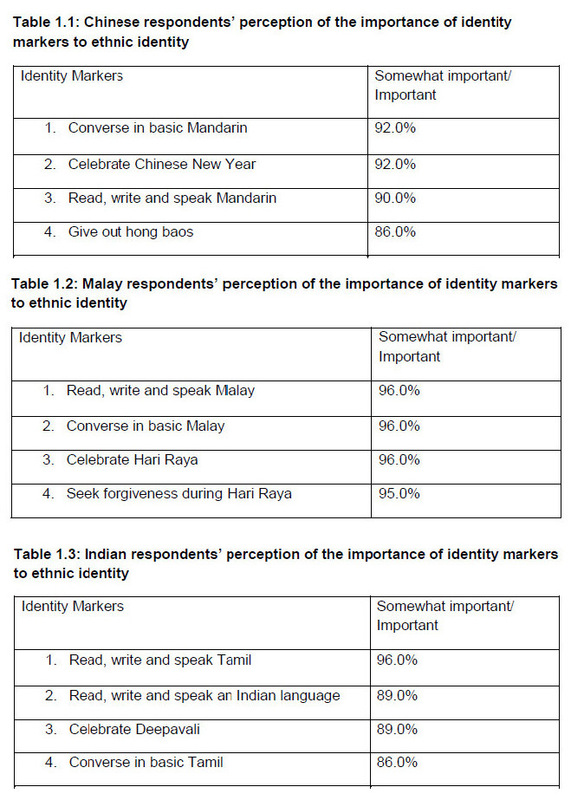 Similarly, more than half of the Malay respondents said that they participated in Chinese and Indian festivals. In the case of Indian respondents, more than 60 per cent said they took part in Chinese and Malay festivals. IPS senior research fellow Mathew Mathews said that given the current levels of inter-cultural exchange, "it is worth considering if more can be done to promote greater interaction, engagement and learning across the racial groups". A joint study by the Institute of Policy Studies and Channel NewsAsia has provided some insight into how ethnic identity is shaped here. Findings from the study, released on Wednesday, have been helpful in pinpointing some gaps and issues in ethnicity dynamics. For instance, the report found that despite high levels of interest expressed in inter-cultural exchanges, many of the 2,020 respondents indicated that they did not participate in the cultural practices of people of other races. The study also found that respondents were more likely to accept new citizens as being "truly Singaporean" if they were from the country's four core ethnic groups. But they were less accepting of new immigrants of other ethnicities, especially if the new citizens were people from less developed regions. The results have already led some inter-cultural groups here to say they will be more proactive in organising programmes for new citizens to mingle more with Singaporeans. And, everyday Singaporeans have suggested households here do more to open up their homes to neighbours and friends during major festivals and celebrations. The study also found an erosion of ethnic traditions and heritage. For instance, millennials placed less importance on the ability to cook ethnic food and felt the same way about ethnic art and music. Still, deeper analysis is needed for some of the results, including why respondents feel the way they do about inter-cultural romances. Experts have cautioned against using the findings to justify employing the Chinese, Malay, Indian and Others classification model in more policymaking decisions. They said ethnic communities are diverse, and it would also be more inclusive to look beyond stereotypes and categories, as well as to reframe the discussion to attain true "multicultural nirvana". A recent survey on ethnic identity shows that many Singaporeans rate speaking English as a more important trait of being Singaporean than being able to trace one's ethnic heritage. The run-up to Singapore's first reserved presidential election two months ago was marked by contention over what exactly constitutes an "authentic" Singapore Malay. As the 2017 presidential election was reserved for Malay candidates, some scrutinised the presidential hopefuls' heritage, their fluency in Malay, and their participation in cultural activities. But without an established consensus on what the most important distinguishing features a Singapore Malay should possess or practise were, the debate among the citizenry could not be easily settled. This is to be expected. While self-identification is an important part of determining ethnic identity, notions surrounding identity will invariably be contested - groups within each community and the broader public have different opinions as to who legitimately qualifies to use a particular ethnic label. To better understand public views on this topic, we had earlier set out to survey a representative sample of over 2,000 Singaporeans. 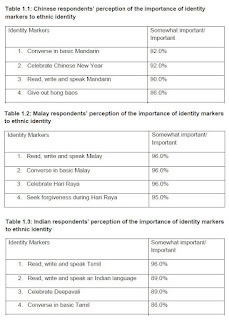 The resulting Channel News Asia - Institute of Policy Studies Survey on Ethnic Identity, among other things, gave a list of nearly 40 ethnic identity markers for each major ethnic community in Singapore, and asked respondents how important they felt these were for one to be considered a Singapore Chinese, Malay, Indian and Eurasian. So, each respondent, whether Chinese, Malay, Indian or Eurasian, would be given the same lists for all four ethnic groups. They were also asked to state their race, so that their views on their own group could be appropriately matched. This project would then allow us to have some ground-up notions of the markers of ethnic identity in Singapore. Across the three main ethnic groups, respondents were unanimous in ranking vernacular language proficiency (Mandarin, Malay and Tamil) and the marking of key festivals as being of much greater significance than other traits such as having close friends of the same ethnicity, the ability to eat in a traditional way (with chopsticks or hands) or appreciating ethnic music and art. At least 90 per cent of respondents from each of the three major races ranked reading, writing and speaking in the community's language as among the top three most important markers of ethnic identity in Singapore. Nearly 92 per cent of Chinese regarded the celebration of Chinese New Year as at least a somewhat important identity marker of a Singapore Chinese, as did 95.9 per cent of Malays when it came to Hari Raya Puasa for a Singapore Malay, and 88.2 per cent of Indians on Deepavali for Singapore Indians. Respondents were also near unanimous in their agreement that the ability to read or write in an individual's ethnic language (93.3 per cent) and converse in one's ethnic language (94 per cent) was at least somewhat important to be passed down to future generations. These findings were consistent across all age groups (our study tapped the views of mostly Singaporeans aged 21 to 74). For instance, 93 per cent of those aged 21 to 25 thought it was important to transmit the ability to read and write in their ethnic language. The proportion of 56-to 65-year-olds reporting similar sentiments was the same. The convergence towards the importance of ethnic language proficiency and festival celebrations can be interpreted as partly resulting from state-led policies. The bilingualism policy, in place since 1959 and which makes it compulsory for students in mainstream schools to learn both the English language and a mother tongue language for at least 10 years, has arguably conveyed the notion that being a Singapore Chinese, Malay or Indian is closely associated with the ability to speak and write in his or her mother tongue. Preserving mother tongue languages via a bilingual education policy has given generations of students cultural ballast amid the perceived worries of the effects of globalisation. Respondents' identification of festive cultural celebrations as a key marker of ethnic identity suggests that state-supported observance of key cultural festivals associated with the different ethnic groups through public holidays, and celebrations in schools and community organisations, have had some effect in fostering a sense of community identity. This is no doubt strengthened by Singaporeans' own celebrations of such festivities in their own families and social circles. One finding worth highlighting was that around 80 per cent of respondents in each of the three main ethnic groups viewed speaking good English as important to being considered a Singapore Chinese, Malay and Indian. This was accorded more weight than ethnic lineage and heritage markers, such as tracing one's ancestry. The focus on English as an identity marker for a Singapore Chinese, Malay, and Indian, despite our different backgrounds and heritage, would probably not have figured as prominently among first-generation immigrants to Singapore. That this emphasis on English is now considered important today, and the fact that it occurred across respondents from the three main races, suggests that there is some acknowledgement of one of the features that binds us - a common language. It also leads to the notion that ethnic identity is just one part of how we think of ourselves. The other is the idea of "being Singaporean". Which figures higher in our consciousness though? 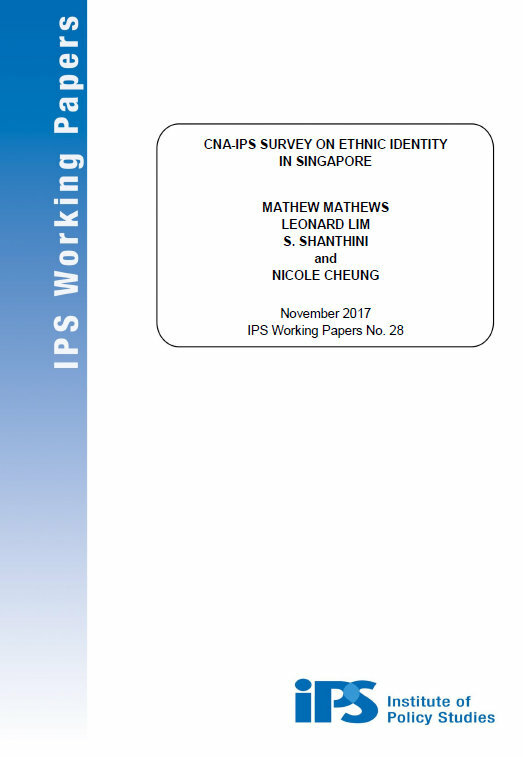 When asked whether they identified more with their ethnic or Singaporean identity, it was the combination of the two that resonated with the most respondents (49 per cent, compared to 35 per cent for Singaporean identity only and 14.2 per cent for ethnic identity only). The fact that a greater proportion of respondents picked a choice involving the Singaporean identity indicates that the notion of "Singaporean-ness" resonates with many of us. In contrast, comparatively fewer see themselves purely in ethnic terms. As Prime Minister Lee Hsien Loong said in May, when we deal with nationals from countries where our forefathers came from, "we are confident of our own Singaporean cultures and identities, even as we are conscious that we are ethnic Chinese, Malays, Indians or Eurasians". This embrace of national identity over ethnic identity - that many citizens see themselves as Singaporeans first, and then Chinese, Malays or Indians next - has other implications. It suggests that, for many of us, there is no contradiction between the dual, hyphenated identities of someone seeing himself as a Singapore Chinese, Malay, Indian, or Eurasian. Because of our immigrant history, and our proximity to China, India and the Malay Archipelago, there have been concerns that loyalties based on ethnic or historical ties may surface from time to time, leading to conflicted allegiances among some. But the survey results suggesting that many respondents view themselves primarily as Singaporeans first indicates a substantial sense of loyalty to this budding nation composed mostly of immigrants, or descendants of immigrants, from diverse backgrounds. Another finding from our survey backs this up. Fewer respondents across all ethnic groups ranked "feeling a connection to the country where ancestors came from" as an important identity marker. Two other aspects of ethnic lineage and heritage: being able to trace one's ancestry to some part of these foreign lands, or visiting the region where one's ancestors came from, were similarly not important markers to most respondents. Our nation-building project is far from over, but the perceptions of respondents from the CNA-IPS study should galvanise us to continue working towards strengthening both our national pride and identity, and the rich ethnic identities that undergird it. Leonard Lim and Mathew Mathews are Research Associate and Senior Research Fellow respectively, at the Institute of Policy Studies, National University of Singapore.